Grace Bradford is living a lie. To the world she has the perfect life: A promising country music career and a husband who adores her. But her husband isn’t the man everyone believes him to be. When a car accident widows her and ends her career, Grace escapes to Delaney Mountain. But moving to the remote town doesn’t wipe away the ugly secret of her marriage. Kyle Delaney never intended to return to Delaney Mountain, but he promises his dying father that he’ll turn their land into a working cattle ranch. He uproots his life in Austin, sells his flourishing business as a music agent, and returns to the Colorado town of his childhood. 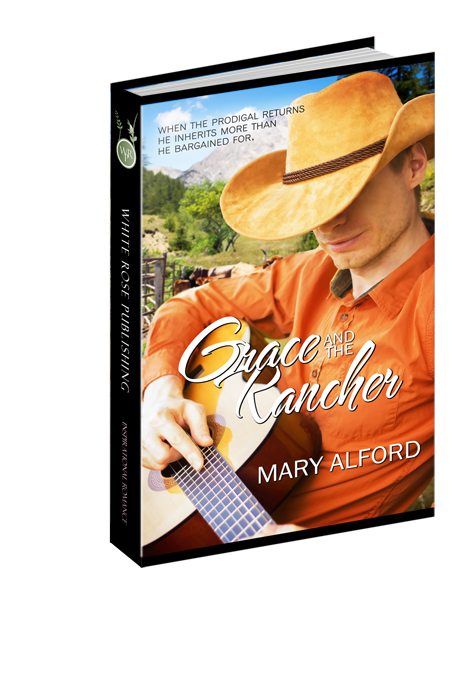 Can a runaway singer and a makeshift rancher, thrust together by circumstance and held together by the common thread of loss and a love of music, find hope and a happily-ever-after under the stars of Delaney Mountain? Grace smiled at her friend’s consideration. When she’d first arrived in town eight months ago, widowed, injured, flat broke, and desperate to find a job and rebuild her life, Martha had accepted her. Grace had been such a wounded soul back then. Still, Martha hadn’t asked a single question. She’d simply given Grace a job and invited her to the small church on the edge of town. Grace had found a home. “All right, hon. I’ll talk to you soon.” Martha hugged Grace then forced the door open against the blustering wind and slipped into the increasing snowstorm. Once Grace was certain Martha’s car would start, she closed the door and went to the back of the store. She brought out boxes of dry goods while keeping a close eye on the weather. By the end of the hour, she’d managed to shelve most of the stock. She turned up the radio and listened to the local weather report. Although the thought was tempting, Grace just wanted to get home. Her dog, Lizzy, would be anxious in this weather. “Thanks, but I’ll be OK, and it’s only a few miles. I’ll see you soon.” She carried out her groceries then turned off the lights and locked up. But the farther she drove up Delaney Mountain, the more doubts she had. Maybe she should have stayed in town. Grace blew out a frightened sigh, and her breath chilled the air as she clutched the steering wheel. Her palms grew sweaty as the SUV slipped and slid on the icy road. She slowed to a crawl as ice and snow began to accumulate on the windshield, destroying visibility. She strained to see, her gaze locked on the road ahead, as the storm continued to intensify. She remembered another terrifying time less than a year earlier. The day her promising career had ended with the death of her husband. To the world, she and Nick had been one of Nashville’s up-and-coming couples. Grace knew nothing was further from the truth. That night more than her career had perished. Everything she believed to be real about her marriage and her husband died along with Nick. Even today—even right now when she knew she should be focusing on the road and the weather—letting go was a next-to-impossible task. At times, Grace still woke up in the middle of the night and could feel the car crashing into the tree, could feel the excruciating pain of the steering wheel slamming into her throat as it damaged her vocal cords. She couldn’t scream or cry out for help. Grace shoved aside those dark thoughts and scrubbed a hand over weary eyes. She leaned forward. She could barely see the hood, much less the road. The conditions were worsening by the minute, and she had no idea how much farther the vehicle would go. She eased down on the gas pedal, and the tires spun, spewing icy debris against the underside of the SUV. The vehicle jerked forward as the tires caught. Grace whispered a thankful prayer. The road continued its upward climb as it snaked around the side of the mountain. Her heartbeat pounded a frantic rhythm as she reached another ninety degree bend. To her right was a sheer drop off. She wouldn’t survive the fall if the SUV went over. Grace gently nudged the steering wheel, at odds with her terror. She had almost reached another treacherous turn when the vehicle slid closer to the edge. She panicked and jerked the wheel in the opposite direction. The vehicle skated backward some twenty feet. The tires lost their tenuous grip and slithered closer to the drop-off. She floored the gas and the vehicle jerked forward, swerved sideways, and headed straight for the overhang. Grace screamed and tried to turn the wheel but it was useless. The Jeep didn’t react to anything. She had lost control. She closed her eyes. She didn’t want to die. Not when she’d just started to live again. “Please, Lord, no.” Grace barely got the words out before the Jeep hurled itself head first over the side of the mountain. Question 1: What caused Grace move to Delaney Mountain? Answer 1: A car accident that took her husband's life. Question 2: What was Grace's previous career? Answer 2: She was a country singer. Question 3: What does Grace do for a living in Delany Mountain? Answer 3: She works at a grocery store. Question 4: What is the real cause of the accident that ended Nick's life? Answer 4: Grace believes he was trying to deliberately cause the accidnt so that he could kill her. Question 5: Who is Tara Michaels? Answer 5: A Nashville reporter who has her own secret. Question 6: Why did Kyle come back to Delaney Mountain? Answer 6: He promised his father he'd try to make the ranch profitable again. Question 7: What secret is Kyle hiding? Answer 7: He was drinking the night he had the accident that almost took his brother's life. Question 8: Who is Jessup Moore? Answer 8: Kyle's father's best friend from childhood. Question 9: What desease did Kyle's father pass down to him? Question 10: Who shows up at Grace and Kyle's wedding? Answer 10: Kyle's brother David.